The primary novelty of the platform here, is that we have a strong attribution of each install acquired for your app through any campaign. The Analytics here helps you delve and study the acquisition funnel for your app. We show you which of your users are influencing more of their friends. We tell you why some users who claimed they referred friends but did not receive rewards – suffered such a fate! Navigate to your Analytics section from the dashboard by a direct click from the hamburger menu. Select the appropriate campaign from the top field. Get an idea of the Invites vs Clicks vs Installs across 3 different visualizations. The graph shows you how your campaign fared across a date range, one which you can select & modify – and thus observe the dips & highs. Just above the graph, you see a parse-funnel that shows your user acquisition journey. If you were to click down on each of those stages/parameters(as in, Invites, Clicks, etc) you’d get a granular level detail in the form of an interactive doughnut chart, which would show their distribution across the social channels. You can schedule Reports to be delivered periodically (daily, weekly, monthly) to any specific email ID right from here. Just click Reports at the top right in the Overview page & configure for the desired frequency. Not every invite or referral sent/broadcast is always acted upon. It is common knowledge that this itself forms the 1st step of the User Acquisition funnel. Hence, AppVirality gives you a deeper look into the metrics by classifying the Invites as Verified & Non-Verified. Every invite which has been acted upon or engaged with (including bot interactions) would be tagged as Verified and all the other invites remaining would be tagged as Non-Verified. This would essentially help you as a Growth Manager or Analyst get a fair idea of how many users did the invite really entice or engage. The Influencers tab under Analytics is the place to get to know which of your users shows pro-activity in sharing your app. You can identify which Invite Channel is working better for them and even advise them on the same. You get details on each influencer pertaining to how many invites, clicks, installs, etc. are to his credit. It also shows details like his Rewards Claimed, Redeemable & On-Hold. Under an Influencer, you can see the list of Friends he has helped bring to your app as users. Below is a short video to help you understand more than that… visually. Whenever in the need of trouble-shooting rewards, like if some disgruntled user calls foul on your referral claiming he did not receive rewards, this is the place to analyze the same. The small i icon beside every influencer gives excruciating details of their behaviour. You can see which Events have been registered against the user’s device, and when. You can also delve deeper into what are the rewards/coupons he has received/availed. Under the Link Clicks section, you can view details of the clicks registered against his referral link across various channels. The above details are enough to figure out when a referral is eligible for rewards and when it isn’t. A reward system contains various reward rules and reward cap which keeps a limit on the reward amount that can be earned through the program by a user but few users may try to earn more reward through some fraudulent mechanisms, to handle such users we already have various Fraud Checks in place but still if you identify any such user you can easily block them from the AppVirality dashboard. you can navigate to Analytics–>Influencers tab, and then click on user information icon of the user you want to block.In user information popup click on block. You will get a confirmation popup , click on yes in the popup. now your user will be blocked and whatever rewards the user and his friends gets will be marked as suspicious.We will not mark the previous approved rewards (rewards before blocking the user)of this user and his friends as suspicious. If you want to unblock a user that too you can do from the same place. You can export the entire Influencers list as an Excel sheet, to run your own data analysis. The Export button schedules a job in the background to collate the data. In a few minutes you shall have a downloadable sheet and it shall be listed under the ‘Exported Files‘ which you can see at the top panel, beside the Add New App button. The Friends tab under Analytics is the place to get to know which of new users (friends) installed your app by sharing your app by your existing users (referrers). You can identify which Invite Channel is working better. You get details of friend and referrer. Below is a image to help you understand more than that… visually. You can export the entire Friends list as an Excel sheet, to run your own data analysis. The Export button schedules a job in the background to collate the data. In a few minutes you shall have a downloadable sheet and it shall be listed under the ‘Exported Files‘ which you can see at the top panel, beside the Add New App button. It is important that you have a place to validate & cross-check the disbursal of your rewards to Referrers or Friends alike. Approved, Rewarded, Rejected, Suspicious, or Under Review. Approved Rewards which have been approved but are yet to be rewarded. If reward type is coupon, it gets rewarded itself post review period completion, but if the reward type is In-Store Credits or Wallet Money, you will have to reward them. Rewarded Rewards which have been rewarded to the user. Rejected Rewards which have been rejected by you. Suspicious Rewards which were found suspicious on the basis on various fraud checks and are put on hold. Its up to you if want to reward them or not. You also get a gross figure on what has been the total amount spent in this campaign towards Referrer or Friend rewards and what amount is currently parked under each status! This would help you override any status, since these statuses are assigned by the AppVirality servers. The servers identify any suspicious behaviour and tag them as Suspicious. This can be overridden by you as an Administrator. You may as well export this data too! There are various Fraud Checks in our system, which when enabled may mark few rewards as suspicious if the user(Referrer or Friend) is found doing some fraud mechanism to earn the rewards. When this happens we mark the reward for that referral as suspicious, specifying cause for the same under comment. Below is a list of all the fraud checks, their description and the corresponding reward comment. Referrals from same IP Multiple Friend Installs from same origin It marks the reward as suspicious if Referrer gets more than 4 Friends from the same IP address. For ex, if Referrer gets 5 Friends and all of them have the same IP address. IMEI Checksum Invalid IMEI It validates the IMEI checksum and marks the reward as suspicious in case the user's device IMEI is invalid. Rooted Device Check Device is Rooted It marks the reward as suspicious if the device used for referral is rooted. Emulator/Simulator Check Device is an Emulator/Simulator It marks the reward as suspicious if the device used for referral is a simulator/emulator, and not a real device. Referral Rate Referrer got more than 4 Friends in an Hour It marks the reward as suspicious if Referrer gets more than 4 friends in an hour. Same Email Pattern Friend & Referrer have same Email Pattern It marks the reward as suspicious if Referrer and Friend have similar Email. 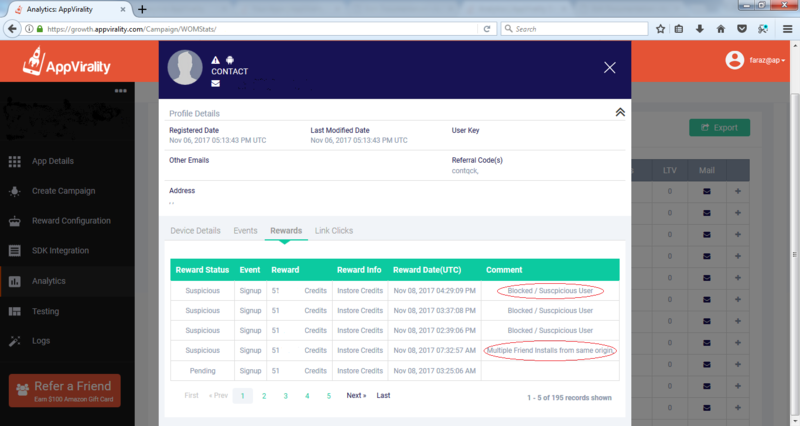 Same IP Address Friend & Referrer are from Same IP It marks the reward as suspicious if Referrer and Friend have the same IP address. It is not recommended to enable this check as it would mark rewards as suspicious if Referrer and Friend are using the same network. Friends Email Pattern More than 2 Friends of the Referrer has same Email Pattern It marks the reward as suspicious if more than 2 Friends of a Referrer have similar Email addresses. Temporary Email Domain User Email Domain is Temporary This check marks the user as suspicious if he/she has temporary Email domains. If a Referrer gets more than 4 Friends in an hour, he/she will get marked as Blocked/Suspicious under comments, and thereafter all his/her referrals will get marked as suspicious without even processing them further.